Seeker's Bad Science podcast explores the scientific principles behind your favorite sci-fi films. Policy wonks take note: If and when the planet is threatened by Godzilla-type monsters rising from the seas, giant humanoid robots may not be the most efficient defense policy. That's among the many conclusions reached in the latest episode of Bad Science, Seeker's podcast dedicated to exploring the real scientific principles behind blockbuster movies and popular genre films. 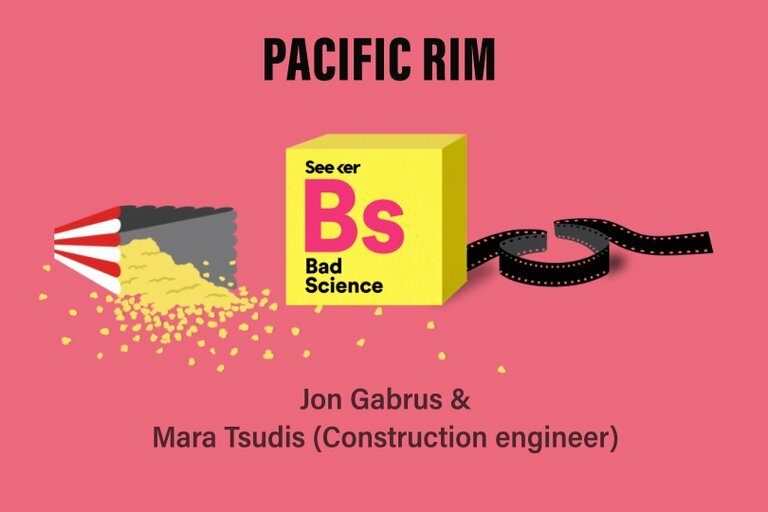 In this week's episode, host Ethan Edenburg is joined by podcaster and comic Jon Gabrus and chemical engineer Mara Tsudis to break down the 2013 sci-fi freakout Pacific Rim. Set on a near-future Earth, director Guillermo Del Toro imagines a war between humans and Kaiju – colossal cosmic horrors ported in through an dimensional window at the bottom of the Pacific Ocean. To fight off the rampaging baddies, humankind has developed and deployed the Jaegers, or “Hunters” — towering robots controlled by human pilots whose minds are linked directly to their massive machines. The existential threat behind Pacific Rim is entirely fictional (we hope) but the film engages real scientific principles. Well, pseudo-scientific principles. In any case, it never hurts to be prepared. Science guest Tsudis's background in chemistry, metallurgy, and industrial engineering comes in handy when discussing the creation of the Jaeger bots. Could we really build 20-story titanium robots? What is titanium anyway? What are alloys? Tsudis raises critical questions about conductivity points and the corrosive effects of saltwater. These are the kinds of things we should be thinking about if we're going to be fighting off Lovecraftian ocean beasties from alternate dimensions. Later in the podcast, the crew questions the wisdom of designing bipedal bots for offshore battles and the very real dilemma of overcoming OSHA regulations in the giant robot industry. It's all in the spirit of reckless conjecture, of course. We're at the movies, after all, and movies have different priorities. Tune in for this week's episode and be sure to check the back catalog of Bad Science in which experts explore the real science behind other sci-fi classics including Back to the Future, Alien, and The Empire Strikes Back.